As seen on the Christian Television Network! 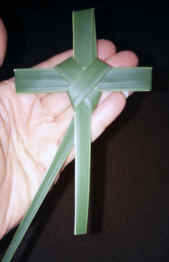 A great Palm Sunday activity! You may print the directions in your church newsletter or distribute copies for families to take home. $3.00 is the suggested donation for use of this project. Click to donate. For personal or classroom use only. Not for resale distribution without consent. If you can't find palm leaves, try a florist shop or cut strips of thin, green poster board, 24-26" in length, with the widest part a half inch wide, tapering to a point at the opposite end.